It was one year ago today that I began a 2,600 mile, four day solo drive from Cincinnati, Ohio to Seattle, Washington during which I posted daily how God had shown Himself to me in one form or another. Last Saturday I set out again for another long drive for this year’s summer vacation. This trip was a 1,286 mile drive to Ingram, Texas, which is a little over an hour northwest of San Antonio, for a family reunion. Unlike last year’s trek, I was joined this time by my daughter, Grace. My wife had gone on ahead by flying to Louisiana and then driving to Texas with another daughter. I always look forward to road trips and one of the things I was most looking forward to on this trip was being captive for twenty hours in the same space as Grace. I’m sure, at age 17, she wasn’t quite as enamored with the idea as I was. She will be leaving for college in a few short weeks and this would probably be our last chance to spend any real quality time together. The level of conversation in the car often depends upon who has control of the stereo. Wanting to make this a pleasurable trip for both of us I relinquished control even though I was driving. This meant I had to listen to a few hours of Bruno Mars, John Mayer and Josh Groban. Pretending to like most of the songs was a small price to pay for this bonding opportunity. Our plan upon leaving home on Saturday morning was to drive as far as Dallas via Louisville, Nashville, Memphis, and Little Rock. But, before we even arrived in Nashville, I could tell from watching my car’s GPS that our ETA in Dallas was steadily getting later and later because of the delays due to highway construction and heavy rains. By the time we were leaving Nashville I decided to make a hotel reservation in Mt. Pleasant, Texas, about two hours east of Dallas. My GPS said we could arrive at 11:30 p.m. I had already lost two hours during a six hour trip. We came to another full stop on I-40 east of Jackson, Tennessee for more construction. We crawled along for about ten minutes when we came upon an accident. A Jeep Wrangler had collided with the rear end of a semi-trailer, and a PT Cruiser was bent in half leaning against a highway sign at the bottom of the embankment off the shoulder of the road. The driver of the Jeep was still in his vehicle and a young woman was sitting on the edge of the shoulder in front of the semi tractor. I saw one other person standing around talking on his cell phone. Grace was driving so I asked her to pull over. I retrieved my first aid and blood borne pathogens kit from my car (I had just received Medic First Aid/BBP refresher training the Tuesday before and thought it would be a good idea to carry a kit on this trip) and donned the latex gloves. I walked to the girl sitting on the ground and asked about her condition. She was holding a towel to her chin in an effort to stem the bleeding from a cut she had received when her PT Cruiser had rolled down the embankment. She said she had movement of her limbs, head and torso and, other than the cut, was just shaken up. Telling her I would be back in a moment I went to see about the man in the Jeep. On my way to check on the driver of the Jeep I met the other man who had stopped. He said he had activated EMS but otherwise didn’t know what to do. I then discovered another man who had stopped but who also didn’t know any first aid procedures. I went to the Jeep and found the young man coherent. He also said he could move his torso, neck and head but that he thought he had a broken leg because he was trapped in the vehicle. Upon inspection, he was indeed trapped and would have to be cut out of the vehicle. As I was talking to the young man another man stopped and came up to me and asked if I was a medical professional. I replied I was not and he said he was a nurse. I asked him to take over here and I would go back to the driver of the other car. When I walked back to the young woman, another woman walked up and said she was a nurse and, after relaying what I could tell of the injuries, I asked her to take over with this patient. I asked the young woman what had happened. She said she was stopped behind the semi and she saw that the vehicle behind her didn’t appear as if it was going to stop so she tried to move over onto the shoulder. 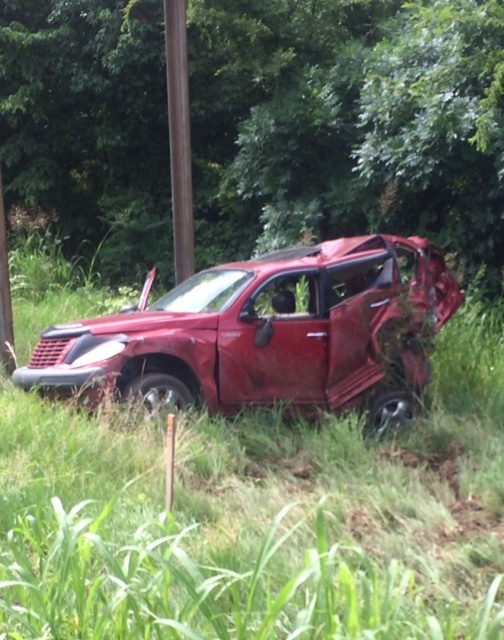 The Jeep slammed into the rear of her car and forced her down the embankment and caused her car to roll over. 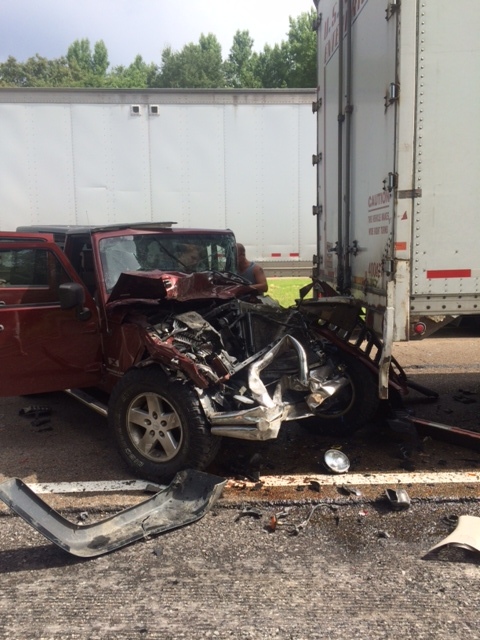 The Jeep then slammed into the rear of the semi-trailer. It was obvious that her defensive driving tactic of looking in her rear view mirror had saved her life. Had she not made an attempt to move to the right onto the shoulder the Jeep would have pushed her car under the trailer and she could have easily been crushed and decapitated. As I knelt, I took her hand and I prayed for God to hold her close to Him, to heal her wounds, both physical and emotional, as well as those of the other driver, and l gave thanks for saving her from injuries worse than she actually received. When I finished praying she had stopped crying, smiled and thanked me. As I walked back to my car I heard the sirens of the emergency vehicles approaching. Grace and I resumed our trip. We stopped in Jackson, Tennessee for reconciliation and mass at St. Mary’s Catholic Church. We got stuck in more severe weather and more construction delays. She conceded and we listened to some ‘70s music from Jimmy Buffet, Jerry Jeff Walker and Marshall Tucker Band. We arrived at our hotel at 2:30 a.m., three hours later than expected. What should have been a 13.5 hour drive turned into 18.5 hours. As my head hit the pillow I remembered my prayers. I thanked God for delivering us safely but I wished we had not had so many delays. I prayed for the two injured young people from earlier in the day and I gave thanks for the opportunity to spend quality time with Grace. And then, the God-moment came to me. I believe now that the delays we had both prior to and after coming upon that accident were two-fold and were meant to be. Even though I may not have been able to do anything to help with their injuries, maybe, just maybe, I was able to be of help spiritually to Julia. Perhaps it was God’s plan for me to be there at that moment in time not to attend to injuries of the body but to strengthen a spirit. And, perhaps God knew that Grace and I needed an extra five hours of togetherness. Jerry, God bless you. You made me cry when you stopped and asked the woman if you can pray with her. Man that is amazing and sooooo touching. Thanks, Norm, but I know you would have done the same. Loved this reflection….and how you are recognizing the wonderful gifts that God has awakened in you. Thank you, Elaine. What were the odds that this string of events would play out like it did, starting with my training the week before, up until the point where I was the first person on-site who had the training to do something even though, as it turned out, I didn’t have to do anything? When the odds get astronomical I just think there is divine intervention in there somewhere.